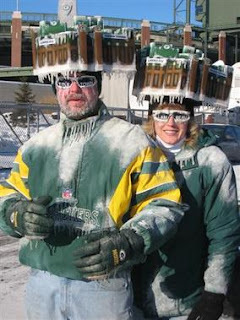 One of my fellow Chicago Now bloggers posted this slideshow of crazee Packers fans today. Funny thing is, he thinks it's mockery but many of these pics are a true and appropriate celebration of the Packer Lifestyle. Even funnier than that, the blog, called Jay Cutler Superstar, opines that Packer fans are currently mocking the Bears for not making the playoffs. Yeah, that's what we sit around and talk about all the time, right? "I can't believe the Bears didn't make the playoffs!" Wouldn't that be like sitting around mocking the local preschoolers for not acing the SATs? And even funnier than thinking we're sitting around making fun of the Bears? The blog is called, Jay Cutler Superstar. jay cutler superstar? really? has this blogger seen jay cutler play? and as an avid and lifelong packer fan, i have not even thought to mock the bears for not making the playoffs. but i will now. I love this post so much. Chicago-based Packers fans, unite!